Another month has passed and we have officially entered the last month of the year! It really is unbelievable how quickly the year has passed us by, especially in my case. I guess work, school, and running a blog will seemingly speed up a year. Anyways, with the passage of another month, it's time for me to delve into what November provided for me in terms of dividends. Overall, I received $41.42 between my Robinhood account and M1 Finance account. 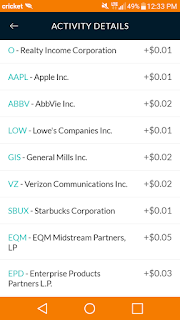 Of the $41.42, I received $41.13 from 12 different companies in my Robinhood account with the remaining $0.29 coming from 15 companies in my M1 Finance account. 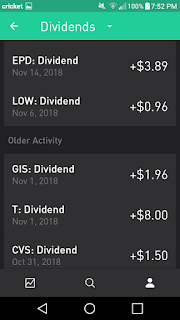 This amount was a YOY increase of over 333% from the $9.56 in dividends that I received in November 2017! 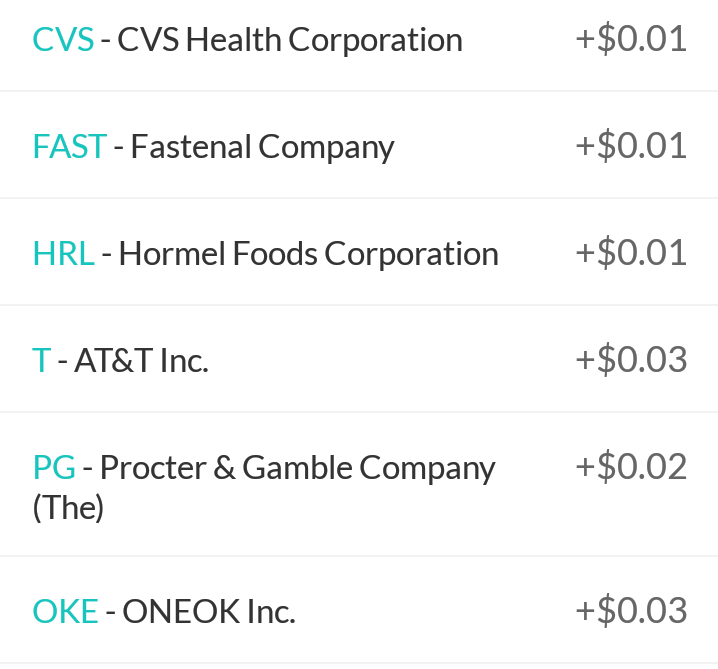 You may have noticed that my Robinhood says that CVS paid me on October 31, which I instead included as November income because the dividend was payable on November 1. I'll certainly take a dividend a day early though! When compared to my dividend income in August, I experienced 0.6% quarterly growth from $41.19 in August to $41.42 in November. Although this seems like a low growth rate, this is primarily due to the effective distribution cut from the Energy Transfer merger. For my 11 shares of ETP, I received 15 shares of ET. This reduced my quarterly distributions from $6.22 to the $4.58 shown above, for a quarterly reduction of $1.64. I received an additional $0.10 from EQM with their recent dividend increase and an additional $0.02 from EPD, for a total of $0.12 in additional dividends from dividend increases (link to November Dividend Increase article). 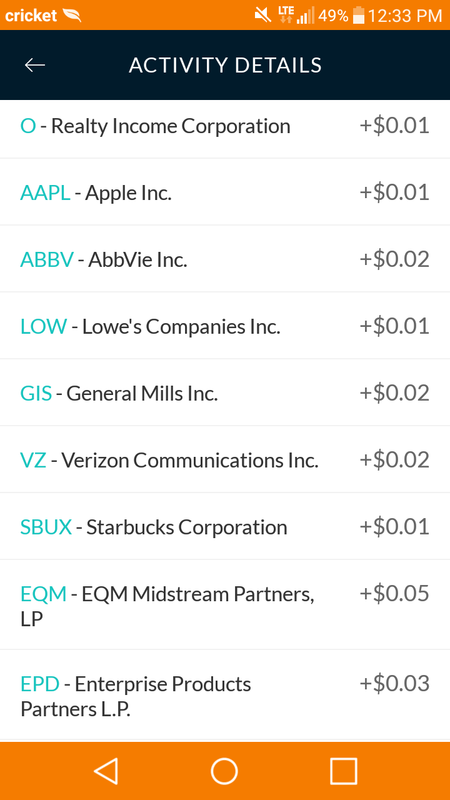 Also, I received dividends for an additional share of T and an additional share of ABBV (from my purchase of ABBV a couple months ago). This increased my income by $0.50 and $0.96, respectively, for a total increase of $1.46 from purchases. Finally, the dividends from M1 Finance added $0.29 in dividends compared to August. The above distribution cut, dividend increases, additional Robinhood accoubt purchases, and the opening of the M1 account led to an increase in dividend income of $0.23 compared to last quarter. Although the growth was basically non-existent this quarter, there was one massive benefit that came out of the past few months. The completion of the Energy Transfer merger will streamline the company structure and strengthen the company's financial position, leading to a much safer distribution. With a coverage ratio of over 1.7 in the recent Q3 report, ET offers one of the safest distributions in its industry, compared to a coverage ratio of just over 1.1 when ETP was an independent publicly traded company. Although a coverage ratio of over 1.1 is considered to be safe for MLPs, 1.7 is absolutely incredible and once more of ET's projects come online, those results will continue to improve. 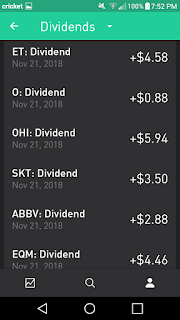 Within my Robinhood account, my dividend income actually declined from $41.19 in August to $41.13 in November. This decline was offset by the addition of the M1 Finance portfolio that produced $0.29 in dividends. Looking ahead to the dividends that will be paid in February 2019, I am forecasting a modest growth from the $41.42 that I received in November 2018. Abbvie announced an increase in their quarterly dividend from $0.96 to $1.07. O, EQM, and EPD should also be announcing modest dividend increases. I don't envision adding any capital to any companies that will pay dividends in February (as I continue to add to Iron Mountain), so the growth will be entirely from dividend increases. How was your November? Did you have any new brokerage accounts pay dividends similar to how my M1 Finance portfolio paid me dividends? With $41 coming in a passive manner you have to be happy with that result. Looks like we share a handful of names paying us both last month. Keep up the good work. Share by share, dollar by dollar. Stay in the DGI marathon! Absolutely, Keith! Well put in describing DGI as a marathon. If it was as easy as a sprint, everyone would do it. 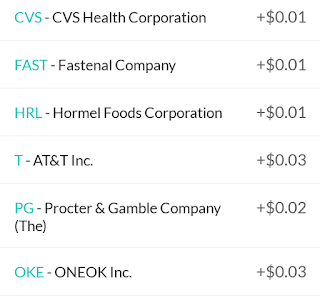 You had a great month of dividends. 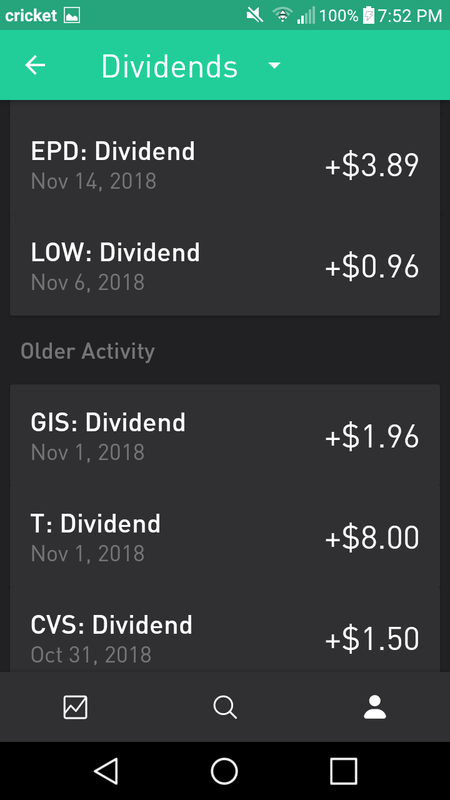 $830 in dividends in one month is impressive! Keep it up! The results look great, Kody. You had some nice growth at over 300%. Keep it going! I own FAST and don't see it in many portfolios. It's been a good performer for me. 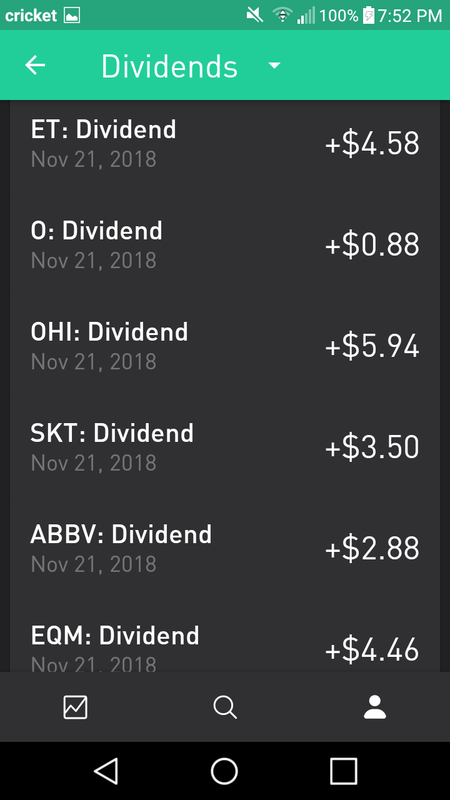 ABBV and LOW have been adds for me in the past few months, but I've been trimming OHI to reduce my exposure to its dividend. Here's to a strong finish to 2018. Thanks for the comment, ED! You had great results as well in November. I don't blame you for trimming exposure to OHI as I did the same thing back in OHI a few months back, selling 7 of my 16 shares.